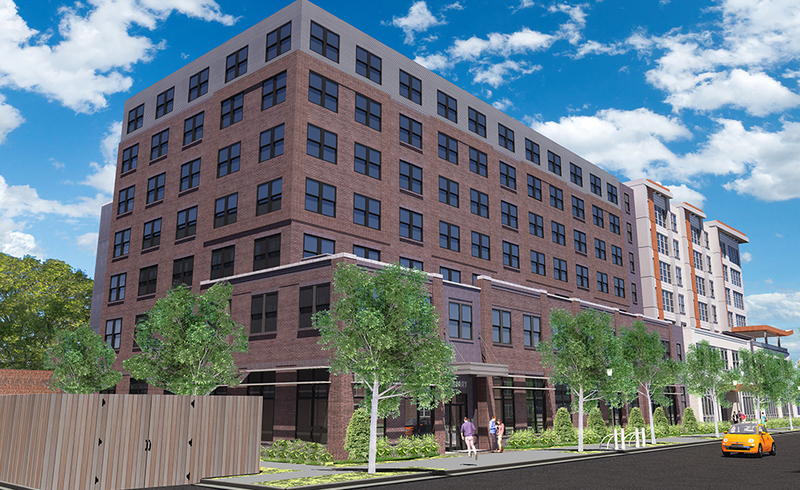 Alexandria Housing Development Corporation (AHDC) and Carpenter’s Shelter are working on a new development that will provide 97 units of affordable housing as well as brand new space for Carpenter’s Shelter operations. We are pleased to announce new apartment community now has its official name: introducing, “The Bloom”. One of the unique “growing” features of The Bloom will be the 1,600 square foot production garden, which will provide produce for residents of The Bloom and Carpenter’s Shelter. This garden will be professionally managed by a third organization, Love & Carrots, who will also coordinate activities and events for residents related to the garden. Other building features include Bloom Books, small library spaces spread through the building, expansive green roofing, a playground accessible to The Bloom and Carpenter’s residents, and upper housing units with views of the US Capitol and the Washington Monument. Interior design features will also reflect this green, growing theme. The Bloom, which will be located above the ground-level Carpenter’s Shelter facility, will serve families and individuals who make less than 60% of area median income (or AMI – you can learn more about how AMI works here). This project comes at a “critical moment” for the Braddock Road Metro neighborhood according to Skow, who calls it an “extraordinary opportunity to create new units of low-income housing and provide a new facility to sustain operations for Carpenter’s Shelter in a high-opportunity neighborhood.” The area has grown rapidly in the past few years, but luxury rate units dwarf the number of affordable rate units. With amenities like the Metrorail line and bus access, Post Office, medical services, schools, recreational centers, and parks nearby, The Bloom will offer a convenient, connected affordable housing option for low-to-moderate income residents. You can see more details about the Bloom on our webpage here. To be the first to receive updates about the Bloom and our other projects, sign up for our mailing list. To learn more about Carpenter’s Shelter, click here. This property is not yet taking leasing inquiries. Alexandria Housing Development Corporation (AHDC) is thrilled to see that so many members of city leadership are supportive of growing affordable housing in the city, as seen from the statements made by Mayor Silberberg and City Council Members Del Pepper, John Chapman, and Willie Bailey in a recent Alexandria Times article (“City council weighs in on fall session”, 9/6). 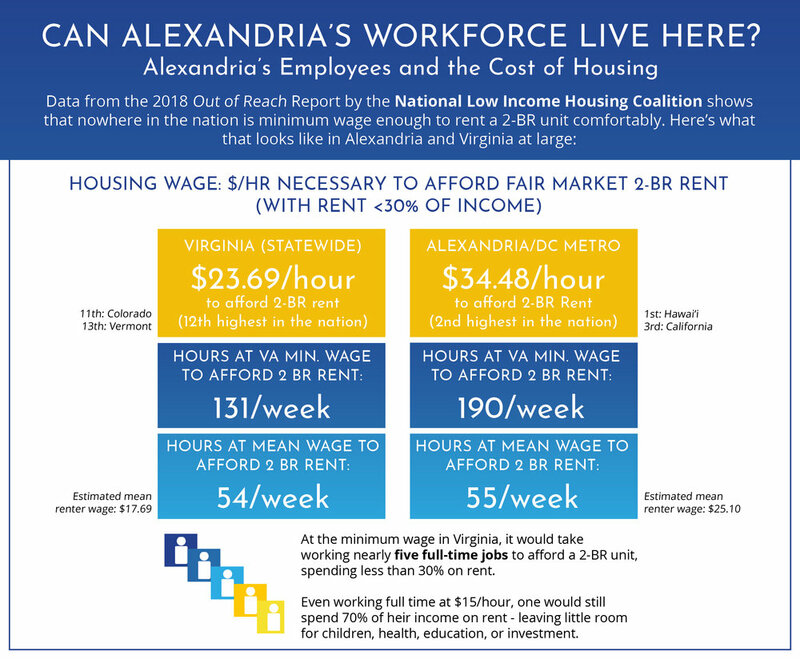 The ecosystem of affordable housing can be complicated, but the problem is simple: Housing costs have outpaced income growth by 2-5 times since the year 2000, and the number of market-rate affordable units in Alexandria has declined by 90% in the same period. Many who have been in our city for decades face an impossible question – give up other essentials (such as health care and nutrition) for rent, or move. Alexandria is an attractive city, and it is natural that people want to settle here. As a non-profit provider of affordable units, AHDC sets out to make sure that it stays that way for all income levels. This is economically imperative, as a city needs a diversity of professions - and thus a diversity of incomes - to survive. Consider this: In Alexandria, a police dispatcher would struggle to find housing for their family of four that would not severely burden their budget, prompting them to look farther and farther outside the city instead. Yet we need police dispatchers to function as a top-tier city, just as we need teachers, legal clerks, social workers, clergy, construction teams, cooks, and home health care aides. Private, non-profit, and public solutions are required to make sure that Alexandria has housing for the labor it needs to continue to thrive. The benefits are not just economic. By allowing more to live local in affordable housing, we reduce the need for long commutes and the accompanying pollution and traffic. We allow seniors with fixed incomes to continue to age in place, so they can stay near their families and communities. We further educational outcomes by keeping children in one home, and one school, when their families don’t have to move to escape high rents. Alexandria benefits from happy grandparents, smart kids, quick commutes and clean air. 80% of Alexandria residents surveyed say that housing affordability is either essential or very important to the city’s future, and city leadership is on board. It’s not a quick fix, but it’s completely achievable. Let’s get to work.